As we age, unflattering frown lines and deep-seated wrinkles can begin to appear between the eyebrows and across the forehead. Skin relaxation can also cause your eyebrows to droop and cover the upper eyelids, making you look tired or angry. Patients who would like to rejuvenate the upper region of their face can benefit from a forehead lift, also known as a brow lift. Lifting the eyebrows and smoothing the forehead will eliminate signs of aging to give you a more youthful and rested appearance. What Can a Forehead Lift Improve? Weak, sagging skin that occurs around the lower face and jawline can detract from your facial definition. Removing excess skin not only smoothes lines and wrinkles, but it can also enhance the definition between the face and neck. Tightening the skin can also improve the appearance of undefined cheekbones and puffiness under the eyes. Tightening the skin helps fill in and smooth out fine lines and wrinkles. 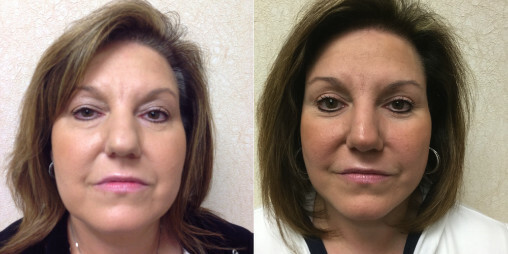 Facelift surgery targets wrinkles that occur at the nasolabial folds, around the mouth, and along the jawline. Erasing wrinkles and fine lines smooths the face for a brighter, more youthful complexion. Dr. Wald will evaluate each patient’s facial features to determine the best options for their specific needs. Your forehead lift procedure will be performed using general anesthesia. An endoscope (thin optical device) and specialized instruments will be used during this procedure, which results in a shorter recovery period than a traditional forehead lift. Small incisions will be made across the top of the scalp, which results in inconspicuous scarring. The forehead and eyebrows will then be raised to a more youthful position, and excess skin will be removed. The incisions will be closed using sutures. This procedure can be performed in conjunction with other facial surgeries and rejuvenation treatments, such as BOTOX® Cosmetic and facelift surgery. You’ve Just Had Forehead Lift Surgery! Now What? Following facelift surgery, you will experience some bruising and swelling. Discomfort as a result of your surgery is controlled using oral pain medication. Your face may feel tight. You should keep your head upright at all times in the week following your procedure. The swelling should begin to subside. Avoid direct sun exposure to the skin. Do not engage in strenuous physical activities. The majority of swelling and bruising will have resolved. You may still experience minor numbness around your earlobes, face, and neck. You can begin to lay in a reclined position but should still avoid sleeping flat on your back. Dr. Wald and his team are available to answer any questions or concerns you may have about the forehead lift procedure. If you are interested in rejuvenating your facial appearance, schedule your consultation with us today! We're eager to inform you of all your facelift options and answer any questions you may have. Schedule your consultation today, and start your journey toward achieving the youthful face and confidence you desire!